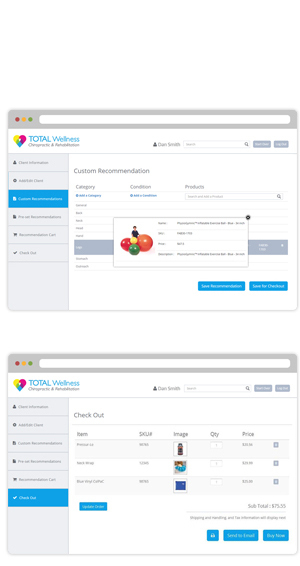 User-friendly tool allows eStore owners to personalize specific product recommendations to end-consumers with just a few clicks. The ability to recommend items to customers is a powerful way to promote products without the pressure of “selling” them. Our development team analyzed the process of recommending items to specific customers, and determined the unique requirements necessary for it to run smoothly and in sync with eStore operations. The first requirement is to keep it simple. Our solution is very user-friendly and intuitive. With one 5-minute training session, a high school student could use the technology. Secondly, the process of generating a new recommendation needed to be quick from beginning to end. The estimated time to input a customer into the system and make an initial recommendation is less than 30 seconds. Thirdly, a customer should have the option to act immediately or at a later time. Our system invites them to purchase on-site right away, or to buy online through the follow-up email campaign. Lastly, the order processing from recommendation to order placement should be 100% automated, which it is. This innovative recommendation program offers an additional tool to boost customer satisfaction while simultaneously generating greater eStore revenues. The new process is fully integrated with our platform application for seamless execution, and has proven to be a huge success since its launch in Q1 of 2015.